The Governor of Osun state, Rauf Aregbesola on Thursday unveiled a multipurpose Park at Gbongan junction in Osun State, in honour of the late Alhaji Alabi Hassan Olajoku. The late Olajoku was a major financier of the Oranmiyan Group, the socio-economic organisation that championed the governor’s election. At the official unveiling ceremony, the governor disclosed that the location of the monument was at the spot where Olajoku was murdered eight years ago. He described the park as a symbol representing the peace that pervades the state. 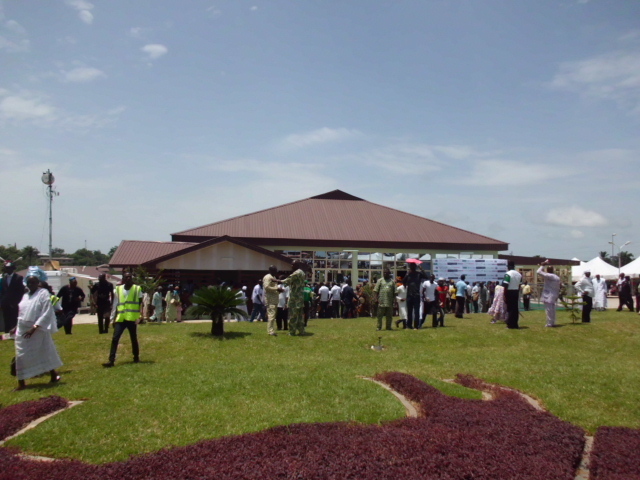 Aregbesola explained that the park was dedicated to the Late Alabi Hassan Olajokun because he believed in the progressive change of the state and died pursuing the course. He said the park is not only a symbol of peace but as another part of the beautification project of his government that will attract investors to the State. The event was attended by the State’s cabinet members, traditional rulers, religious leaders , men and women, old and young from the host community in Ayedaade local government. Prior to the main event, the governor led the attendees on a 2km peace march from Oke -church junction through the town. The project coordinator and Special Adviser to the Governor on Environment and Sanitation, Hon. Bola Ilori said the Hassan Hassan-Olajokun International Park is a testimony that the state has returned to the era of peace, development and progress which signals economic boom for the state.